About 2,000 people were demonstrating in Paris at around 16:00 (15:00 GMT), compared to about 4,000 last Saturday, police sources said. The number of protesters has however fallen significantly since last week, when President Emmanuel Macron, a pro-business centrist, gave in to some of their demands. Protesters appeared disorganized, with scattered groups walking randomly across the capital city. A protestor stands next to a fire during a blockade demonstration by "Yellow Vest" (Gilets jaunes) anti-government protesters at the entrance of a cold storage wharehouse in Le Mans, western France. Many protesters have denounced what they describe as disproportionate actions by police against the protesters, including multiple beatings also captured on video. Though protests in Paris were largely peaceful, violence broke out on the iconic Champs-Elysees avenue in the evening. Much of France, but particularly Paris, has endured weeks of protests that at times descended into violence. They include tax-free overtime and a freeze on gas and electricity prices this winter. The measures are expected to cost an estimated 10 billion euros ($1.14 billion). Two other incidents on Saturday were seen as evidence of growing radicalisation and the presence of extremists within the Yellow Vest movement. 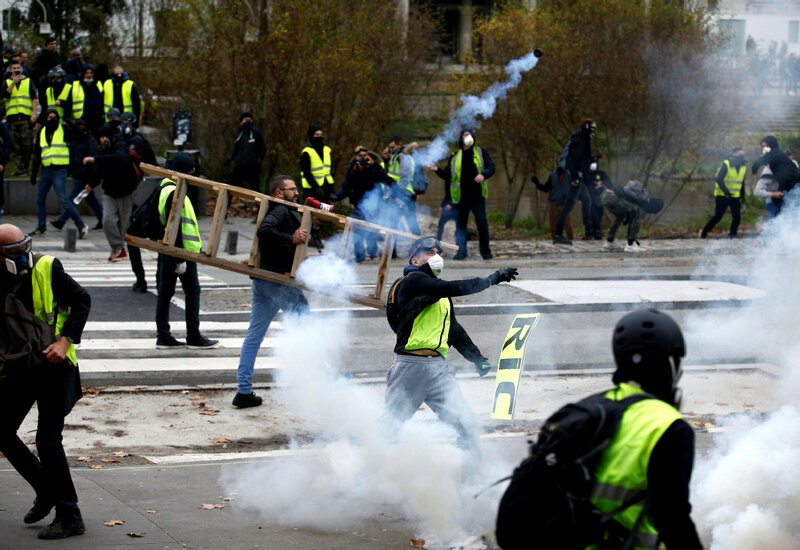 The "yellow vest" protesters began in mid-November to rally against fuel tax increases and subsequently against the wider liberal economic reform policy of Macron, who made tax and salary concessions earlier this month. Ten people have died since the start of the movement in mid-November, mostly in traffic accidents. Outside Paris, around 200 traffic roundabouts remained occupied by protesters across the country. Late on Friday, a 36-year-old man died in Perpignan, southern France, when his vehicle hit a truck at a road block erected by protesters, raising the death toll linked to the demonstrations to 10. In southern France near the Spanish border, dozens of demonstrators blocked trucks and chanted "Macron, resign!" Earlier, protesters had blocked major highways in the nation, vandalising toll booths and shops and causing hefty losses to road operators.